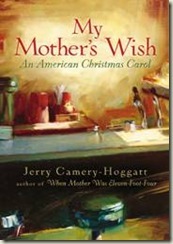 UPDATE: The book, My Mother’s Wish, was poignant and timely. It is a short book that is long on humor and heart. It is hard for me to believe that a book that took less than an hour to read could stir up so many emotions. The main character, Elle, is hilarious; like a modern day Anne of Green Gables. And yes I have to admit I’ve seen Anne of Green Gables. The relationship Elle has with her sister, dad, teacher and mom is identifiable with all of us in one way or another. The ending, which comes way too quickly, was magical. I highly recommend this book for anyone wanting a feel-good Christmas story this holiday season. It will lift your spirits and may even spark a desire to reach out to someone in your own family who needs to be lifted up this Christmas. I HAVE A COPY YOU COULD WIN! LEAVE A COMMENT TELLING ME YOUR FAVORITE CHRISTMAS MEMORY AND I’LL SELECT ONE LUCKY COMMENTOR TO WIN A COPY. A grandfather’s song turns a diner into hallowed ground, like a church. A contrary girl with a gypsy heart feels the tug of home. A mother, far away, confronts impossible expectations. And a truck driver named Jedidah keeps his foot on the gas to sweep you into an unforgettable story of belonging and grace. Readers looking for a meaningful, powerful read on a winter’s evening or with the family will love the rich 1960s nostalgia captured in the Midwest of Jedidiah’s and Ellee’s story; the peace found when family strife boils over, and the gentle reminders of the influence and effect every life has on another. My Mother’s Wish is an unforgettable, powerful tale that ends on a memorable Christmastime note, but will be cherished and reread year-round for its bold message of grand hopes, impossible expectations, and the gift of grace that comes in between. Jerry Camery-Hoggatt, Ph.D., is professor of New Testament at Vanguard University, in Costa Mesa, California. A professional storyteller, he is the author of the highly-acclaimed Christmas stories When Mother Was Eleven-Foot-Four (in trade adult and children’s picture book editions) and Givers of Gifts; plus Irony in Mark’s Gospel and Grapevine: A Spirituality of Gossip. His passion is theology and storytelling, which he believes are meant to go together. Jerry and his wife, Shaleen, are the parents of three children.